Hit a high note with the ultra-high headboard of the Eminence Bed. The convenience the Eminence Bed provides will send shrieks and screams resonating throughout your modern home once the stress of decorating is lifted off your shoulders. Why worry about what to hang over your bed when the high headboard takes care of that for you? The headboard eliminates the need for overhead décor. Well, then you’ve got to agonize over bedding. Huh? Agonize, schmagonize. Luckily, the “no white after Labor Day” rule does not apply to home décor. The bright modern white matches essentially everything, from bolds to brights. 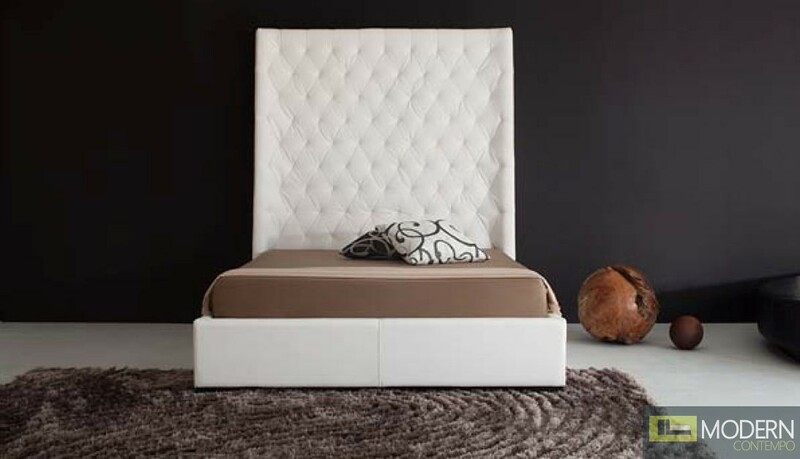 Plus, the high headboard allows you to pile up decorative pillows without blocking the beauty of the tufted leather. Is your family covering their ears yet? Manufacturer provides limited one year warranty.